There is exciting news from the figurine company Safari Ltd®. And now they are available from our museum and online here. They have announced, for 2014, they are introducing new cryptids figurines, first through small toy replicas in a Cryptozoology Toob. They are scheduled for release, generally, early in 2014. The museum has a supply of them now, in mid-December. The seven figure toob dedicated to Cryptozoology contains the following: Bigfoot/Sasquatch (cryptid), Fur-Bearing Trout (fake), Jackalope (fake), Coelacanth (classic species of Cryptozoology discovery), Abominable Snowman/Yeti (cryptid), Giant Squid (classic species of Cryptozoology discovery), and Loch Ness Monster (cryptid). I secretly worked with Safari Ltd® on these items, three years ago, with their designers, through suggestions of what cryptids would be well-known and fun, via photographs and notes from the International Cryptozoology Museum. Anthropologically, popular culturally, and commercially, it says a good deal about a society that has moved forward enough to have cryptozoology toys widespread in stores around the world. I’m still in shock. The great impact of little cryptid figurines being so available in 2014 cannot be overstated. I predict that standard (larger sized figures) will also appear in the near future. I would imagine a Bigfoot figurine would do extremely well in the toy trade. 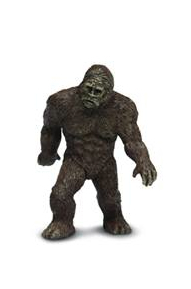 To see a new Safari Ltd® Bigfoot figure, standard-sized, would be great! Safari Ltd®, of course, already has a full-sized Coelacanth. YESSSSSS! Finally somebody came out with these. 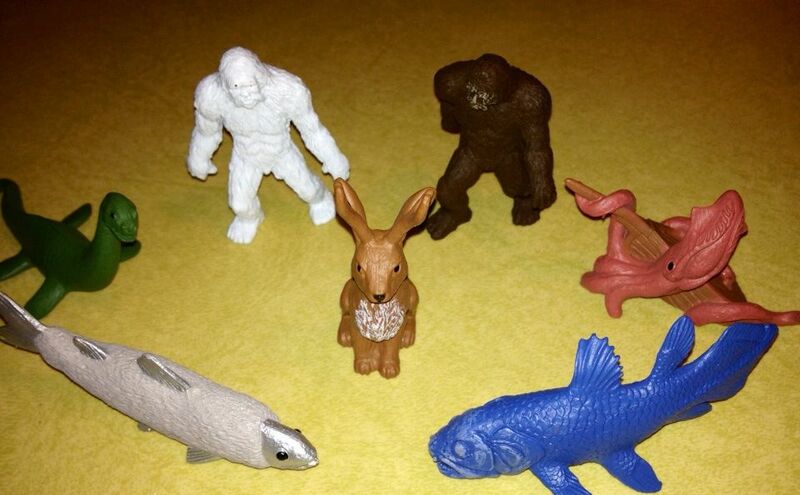 Cryptid figurines are few and far between. And it’s so awesome you were involved. Oh, keep us posted on this – I’m already clearing space in my office for them.